Bathrooms are where cleaning challenges can get tough. To keep your bowl clean, pour a half-cup or so of bleach into the potty each morning or evening and let it sit. With so many different surfaces - chrome, glass, porcelain, and fiberglass - it's difficult to know where to begin or what to use. Instead of endless scrubbing, you'll let the cleaners penetrate, so that all you have to do on most bathroom surfaces is wipe them clean. You'll also need the correct tools: a long-handled toilet brush, an antibacterial scrubber sponge, a squeegee like this one from OXO that is just $15, and lots of paper towels. The bathroom cleaning tips below will have you in and out - and the bathroom buffed - in minutes rather than hours. Microscopic life thrives in the bathroom. Without the proper cleaning strategies in place, even your toothbrush isn't safe from cold viruses, rotavirus, salmonella, Escherichia coli bacteria, and mold and mildew. Your best defense against all these disease-causing organisms is to close the lid of the toilet before you flush to prevent stirred-up germs from escaping into the air and settling on the room's surfaces. After using towels, fold or hang them loosely to dry; this helps prevent germs and mold from getting a toehold. Use a toothbrush cover to prevent airborne germs, yeast, and molds from colonizing on the bristles and getting into your mouth; or consider a toothbrush sanitizer. The following seven-step method to a clean bathroom has you treating the prime surfaces that need weekly attention, while letting the specialized bathroom cleaners do much of the dirty work for you. Sanitize the bowl. Squeeze some of the toilet bowl cleaner around the inside of the bowl and under the rim. Use the toilet brush to swish the cleaner around the bowl, under the rim, and as far into the trap as possible. 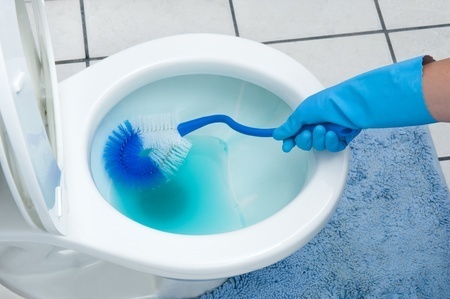 For a clean bathroom, deep clean the toilet weekly. Let the solution stand a few minutes as you clean the seat, lid, and outside of the bowl with an all-purpose cleaner and a sponge, cloth, or paper towels. Using paper towels is the simplest - no rinsing is needed and there's no chance of spreading germs around in the process, as you'll toss out the towels immediately after use. Soapy buildup makes for unsightly baths. Spray the shower or tub and sink with tub, tile and sink cleaner. Let it sit while you complete the remaining steps. Clear the countertop of personal items and spray the surface with multi-surface cleaner like this one from Greenworks ($12). Wipe clean with a sponge or paper towels. Replace your toiletries. Spray the glass cleaner lightly on a cloth and wash the mirror's surface; using horizontal strokes to prevent dripping. Squeegee dry. Use glass cleaner to make the faucet sparkle, too. For extra sparkle, polish the surface when it's nearly dry with a piece of newspaper. The ink used in some papers may smudge the glass when it's wet, so try this first in a small area before attempting to buff the entire surface. Clear shelves and dust. Spot-clean wall smudges with an all-purpose cleaner and sponge. Give full attention to areas around light switches and doorknobs. Use a scrubber sponge to loosen and remove soap scum and buildup in the tub and shower. Rinse clean, thus completing step 2. To make your job easier in the future, and keep a clean bathtub and shower daily: keep a squeegee in the shower or a sponge in the tub for quick wipe-downs of the shower walls and door or the sides of the tub after use to help prevent soap-scum buildup. To keep mildew in check, open the shower door or curtain after use to let it air-dry. If mildew already has a toehold, scrub the surface with 3/4 cup (180ml) of bleach in 1 gallons (4L) of water; rinse clean. Vacuum or sweep the floor. Then mop the floor clean. Empty the trash can and take the bag with you as you go. 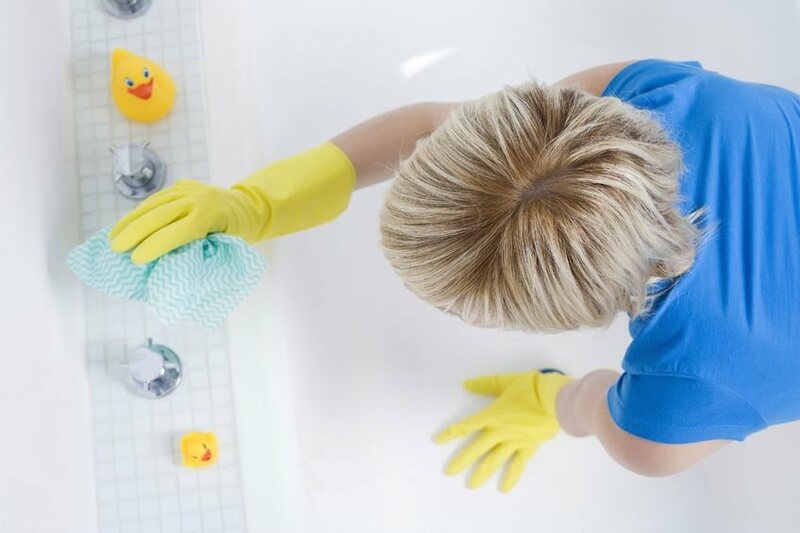 With these 7 simple bathroom cleaning tips, you can have a clean bathroom for your family each week, in less time!